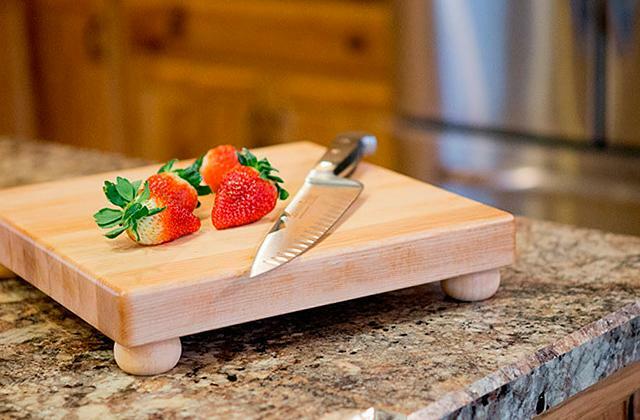 The surface of the bar features a special food-safe oil that protects both the wooden plate and the knives. 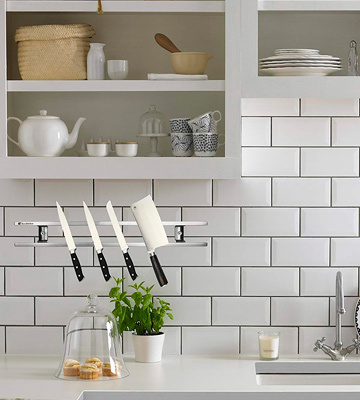 Thanks to this subtle feature, you can use the knives straight from the organizer without washing them. 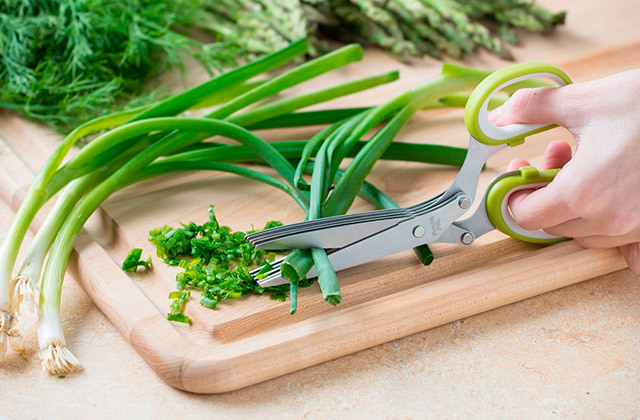 It is recommended to thoroughly dry the knives before hanging them onto the magnetic stripe. This model is ideal for any type of kitchen from a small apartment to custom-built ones. The array of different sizes and materials makes it easy to find the one that fits both the design and requirements of your particular kitchen pieces. 16" x 2" x 0.7"
On top of eco-friendliness, the bamboo is resistant to water and sunlight, making it extremely durable and prolonging the service life of the knife stripe. The hardware is not suitable for thick walls. 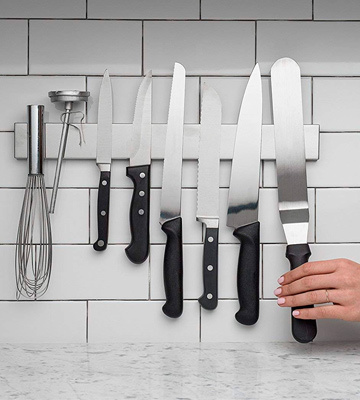 This magnet organizer from Premium Presents is a good solution for storing knives with blade lengths of 7 inches and longer. Thanks to the reinforced neodymium magnets, the bar holds massive tools with ease. 17" x 2.5" x 1"
This bar is distinct thanks to its magnetic bar that is double-sided. This design choice allows attaching the stripe on any metal surface even without using screws. The housing is not quite scratch-resistant. This powerful and functional stainless steel magnetic bar from Modern Innovations has neutral looks and will fit virtually any kitchen design out there. Thanks to its powerful magnet it can also be used for storing bulky metal tools without too much effort. 15.75" x 1.8" x 0.5"
The kit comes with 6 strong hooks that are designed specifically for storing wooden and plastic cooking ware that have special hanging loops. Thanks to the design of the bar you can freely move them however you want to accommodate more tools. The magnets lack power when it comes to storing larger knives. A perfect choice for a small kitchen, this model can fit both metal and non-metal utensils with ease. 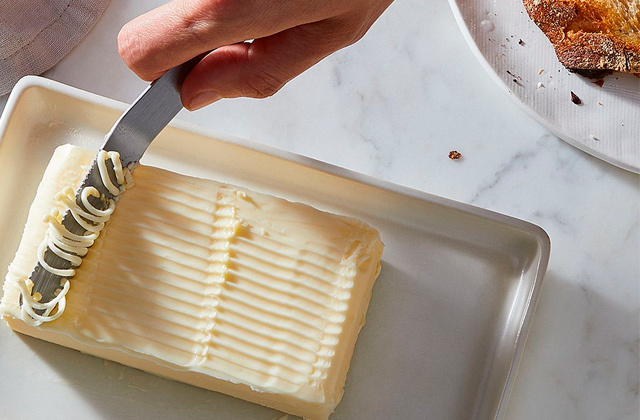 By saving space and keeping the knives at an arm's reach it will make cooking as easy as it can be. 18" x 2.4" x 0.9"
The double magnetic bar takes the whole length of the wooden panel which allows storing more knives at the same time. Likewise, the lower magnet provides that much-needed grip to your metal tools. The design is rather clunky due to the lack of hole covers. This model from Norpro features two extremely powerful magnets that together can hold up to 30 lbs of load. On top of that this simple and effective design makes it easier to store knives with long blades contrary to other popular kitchen organizers. 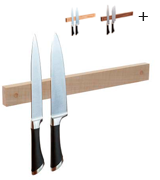 18" x 2" x 1"
This magnetic knife rack from wooDsom is one of the most universal models available today and not simply due to the enormous load capacity of its magnetic bar. First things first, the item is available in a variety of different colors from maple and oak to purpleheart and hickory. The scratch-free wooden surface of the unit just screams heavy-duty, aside from being quite pleasant to look at, and which will fit any interior. 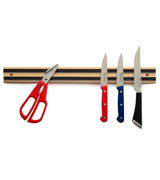 As for the sizes, the magnetic knife rack has an impressive size chart that starts at 8 inches and goes up to 36 inches. What is more, this is, perhaps, the only model that you can order with a custom length. Specifications aside, let’s take a closer look at the bar itself. Each unit comes as a plain wood board that features a magnetic bar inside the housing. Additional elements include two joints on both sides of the bar that hold the wooden plate and the wall hangers together. The kit comes with a set of mounting hardware, which is quite robust and durable as for what looks like a set of generic screws. 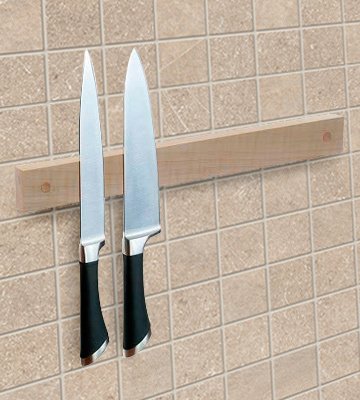 All things considered, this is by far one of the best magnetic knife holder products on the market. 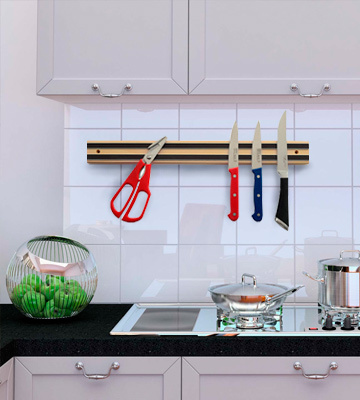 Simple in design, this effective knife storage bar is an essential part for your kitchen if you want to save some additional space. 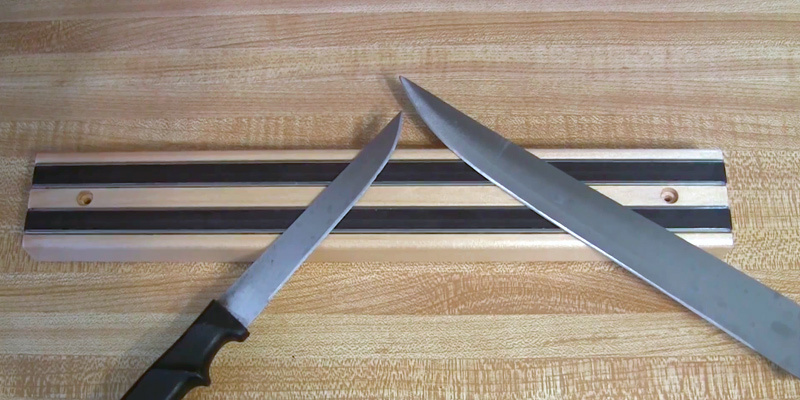 Made of genuine bamboo, this knife stripe is fairly lightweight yet sturdy enough to hold even the largest knives that you may have in your kitchen. Since bamboo fully grows only in 3 to 5 years it surely is eco-friendly compared to other genuine wood types that take up to 40 years to grow before they can get harvested. 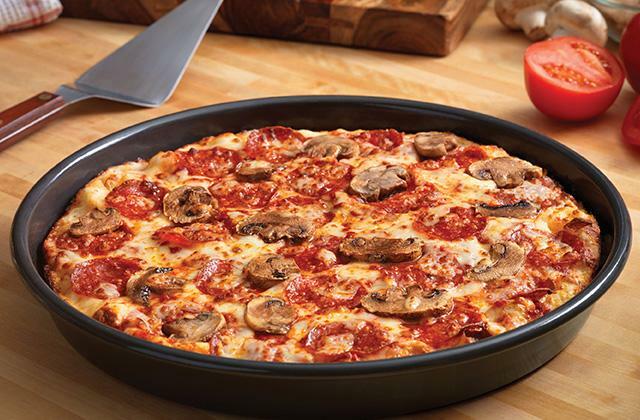 The plate itself is not made of a solid wooden piece, though. Instead, it is assembled from multiple pieces that form one single bar. The overall thickness of the stripe reaches almost 1 inch, which leaves enough room for a heavy-duty magnet in the front side of the panel. That said, this model is not suitable for use on the refrigerators and is better suited for spots above the kitchen pieces or under cabinets. Speaking of magnets, this particular one can hold most metal pieces without any issues, however, it is not designed for storing tools that feature additives beside metal or steel. 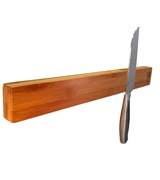 So if you intend on using this wood magnetic knife holder for storing decorative or specialty knives you may run into issues. As for some convenience features, this setup comes equipped with hardware designed for installing the stripe on drywall, so in case you have rather thick walls we recommend opting for the longer type of screws. 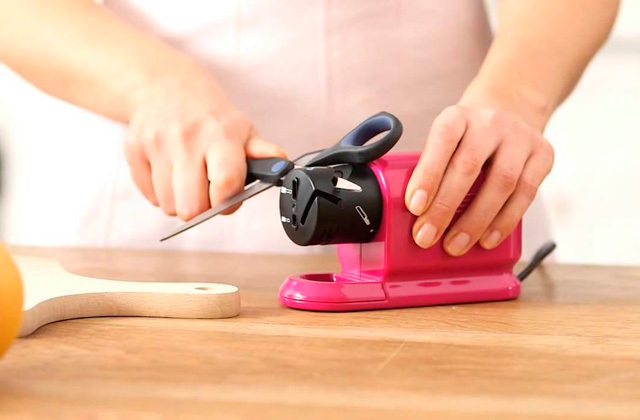 All in all, if you are looking for a budget- and ecologically-friendly magnet holder for your kitchen tools, this is one of the top models for this role. The 15.75-inch magnetic knife bar from Modern Innovations brings a little bit of variety to our review with its full-metal design. The unit has an aesthetic look, thanks to its polished surface made of stainless steel. The installation process will take just about 15 minutes, given that you have power tools required for drilling the holes for two 1.25-inch screws that come together with the knife strip. After you attach the stainless steel frame to the wall using the screws you will need to carefully put the magnet stripe on top of it. When you align the bar according to your needs it will hold all of your tools firmly. In order for the magnet to hold the tools and knives properly, you will have to attach them to the stripe with the blade first. This is required due to the fact that the neodymium magnetic has limited grip surface in the front that can obstruct its full capabilities. Other than that slight issue that can be easily avoided there are no major flaws to this model but is still important to keep in mind to avoid tools falling off. Although the steel holder can be used with the magnet it is not required by design. This way you can attach the magnet on your fridge for saving space under counters of your kitchen. 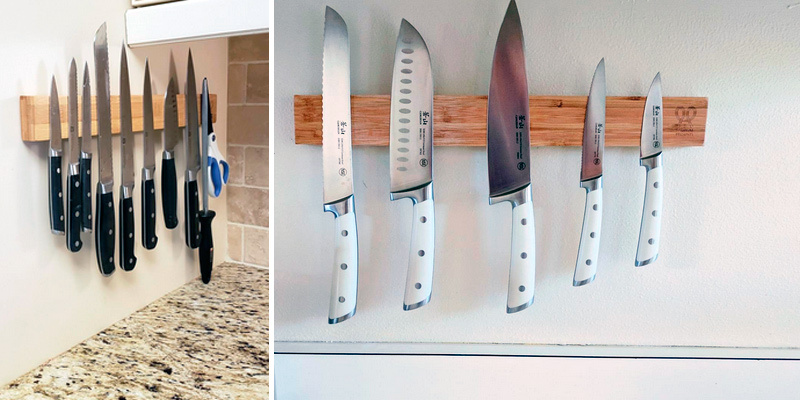 Thanks to the stainless elements and a powerful magnet, this is one of the most durable and versatile knife hangers among other similar products. So, if you are keen to save that much-needed space without the need for screwing your walls - opt for this model. 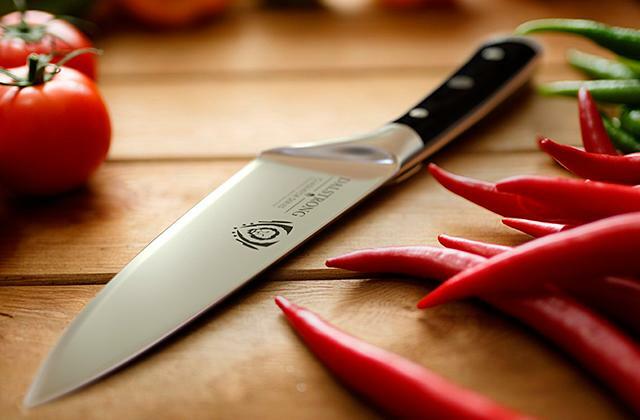 It is good when knives and other metal kitchen tools have their own storage place, but what to do with other utensils that are not made of metal? 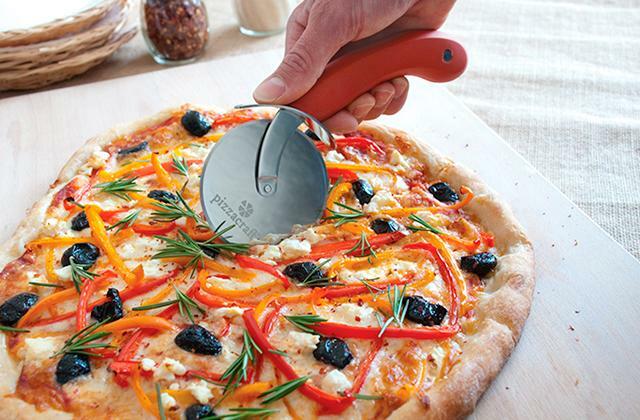 Thankfully, Eco Kitchen has a product that will fix this issue and provide additional space for metal tools at the same time. The unit is available in 3 different sizes: 12, 18, and 24-inches, which makes it easier to fit the design of your kitchen. Made of ecologically-friendly materials the storage stripe consists of a stainless steel frame and a powerful, heavy-duty neodymium magnet. Moving on, the hardware includes mounting screws as well as 6 steel hook hangers that are designed specifically for polymer and wooden kitchenware. 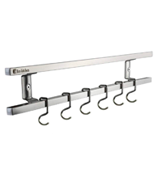 Since this model is designed for hanging items with double-sided hooks it will require a little bit more space to accommodate all your utensils, compared to magnetic bars without them. Additionally, the hooks are removable so you can use them separately from the kit. If the regular magnetic bars don’t fancy you, then maybe it is time for something more elaborate. 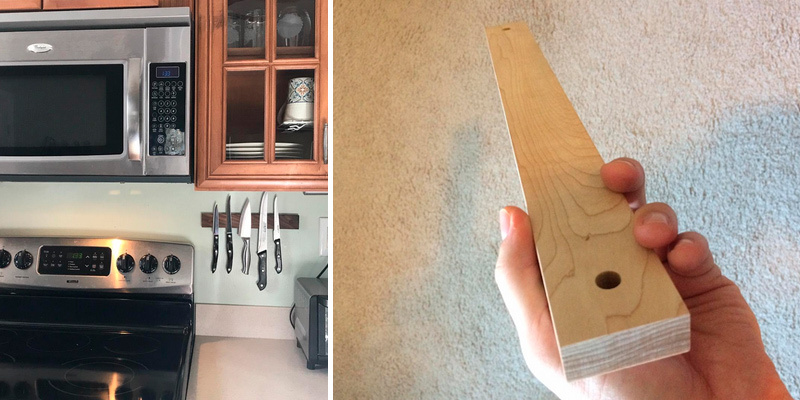 And this magnetic knife strip from Eco Kitchen fits the bill quite well: it is affordable, light, and easy to install - definitely a go-to solution for storing synthetic and wooden utensils. 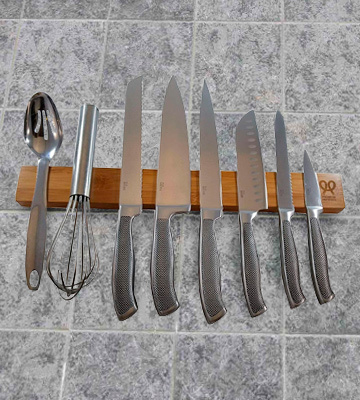 The Norpro wall mounted knife organizer is a basic model that is perfect for small to medium kitchens that will not only help you in storing utensils but also save quite a lot of space. 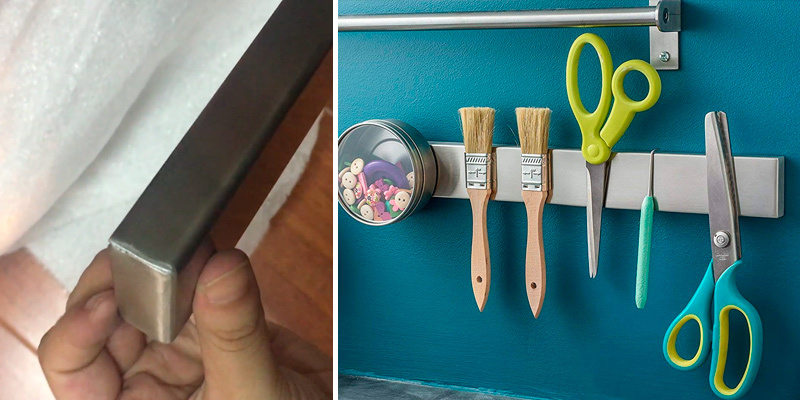 Instead of storing the cooking ware under cabinets or on shelves this simple yet highly effective magnetic bar will keep them within a hand’s reach. 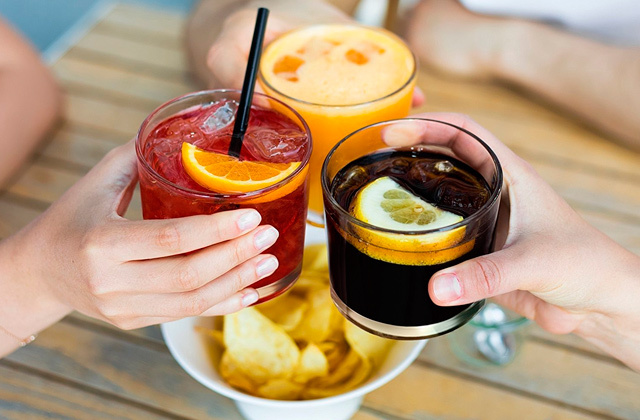 As an alternative to single-bar organizers, this kit includes two bars that deliver a firm grip on both the bottom and the top side of the unit. Even though it is advertised as a storage option for the kitchen it can be installed almost anywhere you need. This way you can easily store any other type of metal tools including workshop and garage items. The only gripe with this wooden panel is its rather clunky design that has two uncovered holes. That said, it won’t affect the tools that you intend to hang on it in any way, so, except for an aesthetic part, there’s nothing to worry about. The installation of the magnetic bars will take you just a few minutes and will require two drilled holes. Luckily, you won’t need any screws since this kit comes with its own set of hardware. 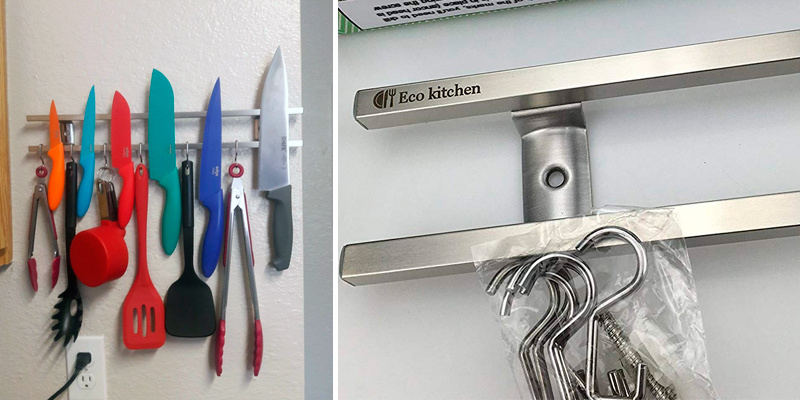 As simple as it gets, this magnetic knife storing bar is an essential kit for any kitchen thanks to an affordable price and a combination of two magnets that can store even the heaviest knives at your kitchen without any issues. 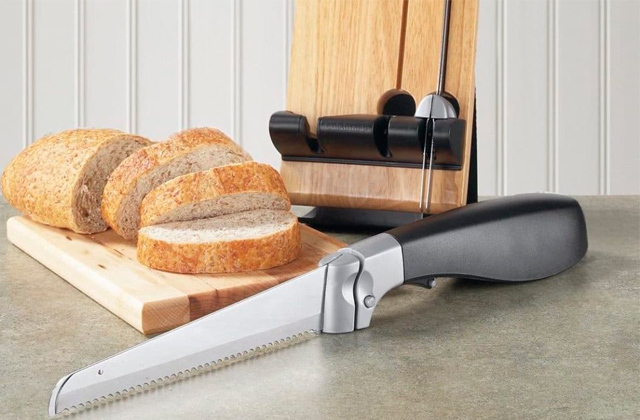 What Is a Magnetic Knife Holder? 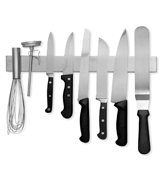 As the name suggests, magnetic knife holders are kitchen devices that feature magnets. More specifically, they utilize extra-strong magnets that can hold heavy loads without breaking a sweat. A regular design consists of a wooden or metal frame that features a built-in magnet in the back side of the housing. 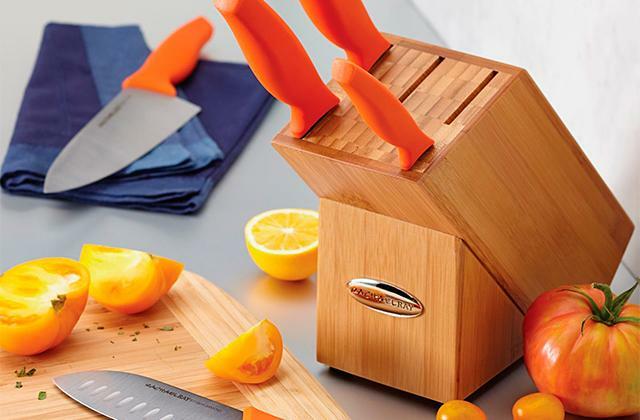 Simple in their appearance, the knife blocks look neat in almost any interior, contrary to basic magnet bars that resemble a simple piece of metal. When choosing a knife magnet for your kitchen you should take into consideration the size of the bar as well as the magnet’s maximum load capacity. Depending on your needs and the layout of the room you can opt for wooden or metal models. Although the latter may look pretty basic when it comes to kitchen accessories, the metal bars are easier to clean in comparison to the wooden ones. Additionally, the majority of wall mounted knife strips come equipped with installation hardware so it is important to check their quality as well, if possible. 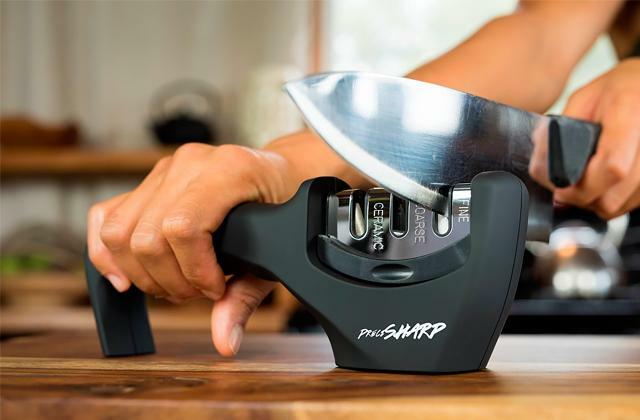 If you want to keep your knives as fresh and sharp as new we recommend purchasing a simple and effective knife sharpener. 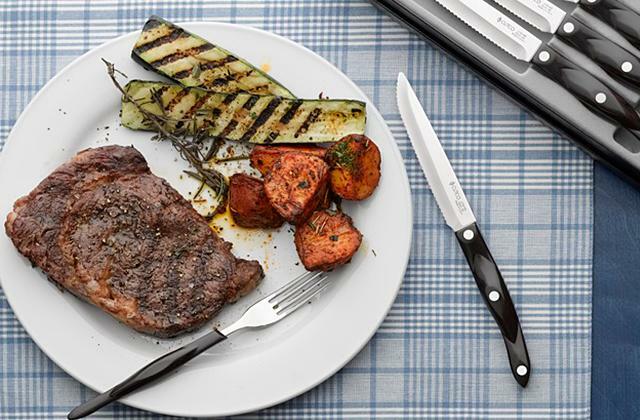 To further improve your cooking skills and to make it much faster opting for a nice chef knife has always been a safe bet as well.